As metro Atlanta’s temperatures grow colder, the demand for heat is, well, heating up. Lecher Eady (left) the mother of 16-month old triplets waited since midnight in the cold for hopes of getting financial assistance Thursday Dec.2, 2010 at the Mansour Center in Marietta. The single mother who has held 3 different jobs in 2010 is laid off from health care work. 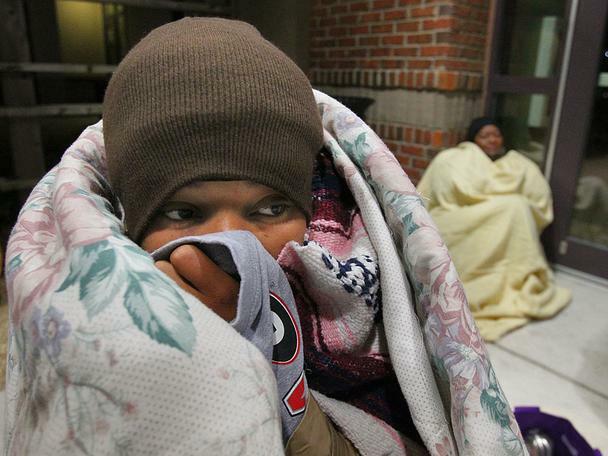 A day after hundreds of people queued up outside a Marietta community center to apply for assistance with heat and power bills, hopeful applicants began lining up again around midnight, waiting in the sub-freezing temperatures for the doors to open Thursday morning. This time, however, officials let those in line come into the Mansour Center on Roswell Street an hour early at 7:30 and get relief from temperatures that dropped to 27 degrees. Eady, the mother of triplets in diapers, said she has been out of work since August. Eady said she is trying to start a nonprofit organization, “Babies Need Diapers,” that would provide diapers to low-income single mothers. Joining Eady near the front of the line that had grown to about 30 people by 7:30 was Isata Kamara, a single mom of a 3-year-old. “My electric bill and my gas bill are going to get cut off because I don’t have the money right now,” said Kamara, who recently lost her job. “I saw it on the news and decided to come up here because I really need the help,” she said. Those news reports Wednesday night showed hundreds of people who lined up around the building throughout the day on Wednesday. Channel 2 Action News reported that ambulances were called for at least two people who had difficulty dealing with Wednesday’s cold temperatures. In DeKalb County, Atlanta police were called to the Atlanta DeKalb Human Services Building on Warren Street Wednesday morning after “loud arguing” broke out among a large crowd gathered to apply for energy assistance, according to police dispatchers. The mother of six said she “heard it was ridiculous” on Wednesday, when only 30 people at a time were let into the assistance center.“Hopefully, we can get in and get help,” she said. That heating assistance will come in handy next week, when a surge of cold Canadian air will send overnight lows in metro Atlanta plummeting to the low 20s, with afternoon highs warming only into the mid-40s. The forecast for metro Atlanta calls for sunny skies and highs in the 50s through Friday, with overnight lows around the freezing mark. There’s a 20 percent chance of showers on Saturday, when highs will be in the upper 50s. Sunday will be windy, as a cold front arrives and keeps temperatures in the 40s. Overnight lows will be in the mid-30s Saturday night, mid-20s Sunday and Monday nights and low 20s Tuesday night.